Why is it that some churches are vibrant while others are simply dull? Is it because of the quality of the sermons? Or is it because of the warmth of the fellowship? Or is it because of something more practical like logistics, travel, or the convenience of something more unusual like parking? Starting this week, I like to launch a series of three reflections about spiritual vibrancy. In conjunction with May 30th, 2015 as Global Outreach Day, I would like to say that vibrancy comes about with three things. First, the preaching of the Word. Second, the fellowship of the people. Third, the passion of outreach of the community. 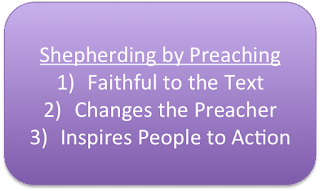 Both the second and third elements are active responses to the preaching and teaching of the Word of God. With the preaching of the Word, there needs to be a response. Without any responses, the Word remains within the four walls of churches and Christian communities who gather each week for worship. One of the most striking traits in any revivals is the strong preaching of the Word. In the 18th Century (1731-1755), in what we know as the first great awakening in North America, we have men like Jonathan Edwards and George Whitefield, whose powerful preaching revitalized the entire society to go forth in faith and witness of the gospel of Christ. In the nineteenth century (1790-1840), there is the American spiritual awakening with Francis Asbury (Methodist), Henry Ward Beecher (Presbyterian), Charles Finney, and others who inspired a new generation with powerful preaching against the ills of society. Then comes the 20th Century (1850-1900) spiritual awakening, thanks to the Pentecostal movement and the Holiness movement. People like Dwight L. Moody and Ira Sankey were household names. In the 21st Century, we will all recognize the names of Billy Graham, Dr Martin Luther King Jr, and in our modern days, Chuck Swindoll, Rick Warren, and Tim Keller. Many of the megachurches all had one thing in common: Powerful preaching over the pulpit. As a "distinguishing mark," everyone look forward to a good sermon. They expect a message from God. In some communities, everything is arranged and gathered according to the preacher's message. The songs are selected based on the passage. The theme of the worship service is centered around the message in the passage. 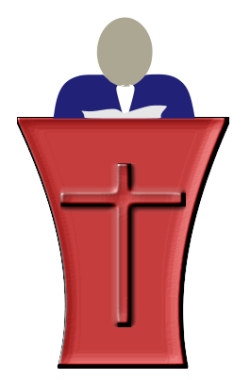 The overall direction of the worship service is focused on the pulpit. 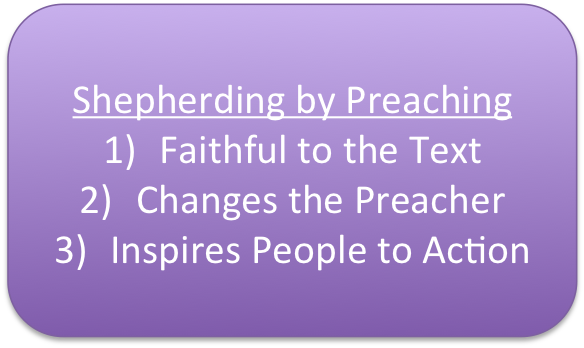 Charles Jr goes even further to say that "biblical preaching is the central, primary, and decisive function" of people called to shepherd the Church. That means pastors and all in the pulpit ministry. How does that look like? A good sermon does at least three things. First, it is faithful to the text. Psalms 1 lays the foundation of what the Word means for us. "1Blessed is the one who does not walk in step with the wicked or stand in the way that sinners take or sit in the company of mockers, 2but whose delight is in the law of the Lord, and who meditates on his law day and night. 3That person is like a tree planted by streams of water, which yields its fruit in season and whose leaf does not wither— whatever they do prospers." It is always important to ask ourselves what our actions or reactions are based upon. Is it upon the Word or is it one's personal opinion? Is it based on biblical foundations of interpretations or is it based on subjective viewpoints? Asking whether our opinions are faithful to the text will be a good exercise in itself. I am particularly concerned for Christians who attack one another on the basis of a subjective interpretation. The truth is, we are called to judge not, lest we be judged. Instead, we are called to preach the Word in season and out of season, and always to be prepared to give the reasons for the hope of faith. Second, it changes the preacher. I remember a preacher friend telling me about how his own spiritual life is lagging when he was not preaching. On the one hand, there is something positive to take home. That when the preacher is studying and dwelling on the Word, there is a certain sense of spiritual awareness and growth. When the Word changes the preacher, it changes the preacher from the inside out. On the other hand, there is something disconcerting. Does that mean that when the preacher is not preaching, his own spiritual life grinds to a halt? This is why I believe that every preacher must have his own set of discipline. He cannot depend on pulpit commitments to drive his own spiritual curriculum. He needs a spiritual journey that is independent of what he is going to preach that week. That is why 1 Tim 4:2 (2 Tim 4:2, Thanks Peter!) is very instructive. In season or out of season can also be applied to a preacher's pulpit schedule. Whether he is preaching or not does not shape his own spiritual life. It is always the Word. Third, it nudges the heart to want to do something about it. When a message is merely good entertainment for the ears, it will not go beyond the ears. When the Word misses the heart, the world takes over. Jesus warns us about the listening of the Word and the practicing of it and likens it to the building of a house on sand or on a solid rock. The preaching of the Word is like the building of a house. Assuming that the quality of the materials and workmanship are similar, what is different will be where the house is going to sit upon. When listeners put the Word into practice, the ground is a solid and unmovable rock. If not, it would be sand. May the preaching of the Word each Sunday brings life. That is the counsel of Mother Teresa of Calcutta,who prompted:“Spread love everywhere you go:First of all in your own house. . . . Let no one ever come to you without leaving better and happier.Be the living expression of God’s kindness; kindness in your face,kindness in your eyes,kindness in your smile,kindness in your warm greeting.” Best wishes.